Home / Bestsellers • Damaged Hair • Dry Hair • Hair Steamer • Healthy Hair • Max Hydration Method • Moisture • Soft Hair / Professional Hair Steamers: Which is the Best? Hair steaming is the act of using heat to open up the hair shaft. This process allows hair products to penetrate and work better towards hair goals. The hair steaming process involves using water and heat in a gentle infusion to lift the hair cuticle. Hair steaming is useful for all hair types whether natural, relaxed, chemically treated or color treated. Hair steamers promote elasticity, making hair more supple and stronger. It helps kept hair soft and moisturized. If you have a dry hair issue, regular steaming with the right products and natural oils can go a long way in helping your hair retain moisture. If you’ve previously straightened your hair and are unsure if you have heat damage, several hair steaming sessions can help you determine if your hair can revert or it’s time to snip. Sometimes overly dry hair can masquerade as heat damaged hair. Read How to Blow Dry Hair Without Heat Damage. 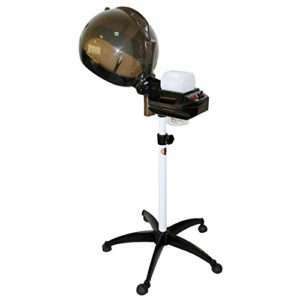 The moist heat from hair steamers also encourages blood flow to the scalp area and follicles. Effectively moisturized hair means less breakage. 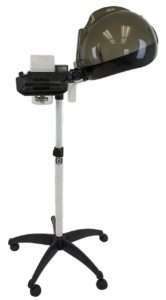 What To Look For in a Hair Steamer? It needs to have a big hood so you can get all of your hair under there especially if you’re going to pile it on top of your head. A good hair steamer should come with at least a year’s warranty so you can return it if something goes wrong. If it’s less than a year, don’t bother with it. 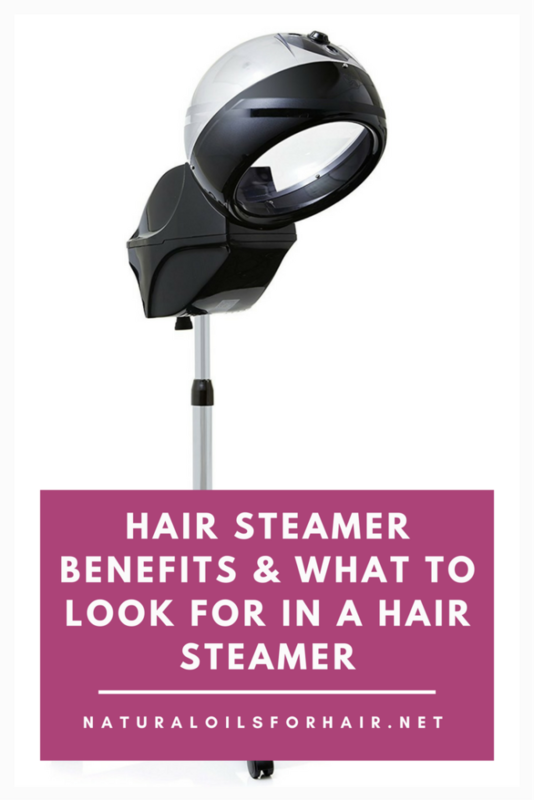 Choose a hair steamer with a timer so the process is more effective for you. If it doesn’t have a timer, then one that auto shuts off or makes a sound once the water container is empty. Make sure the stand is adjustable so you can move it up and down to suit the area of your home where you decide to use it. It would be nice if it had wheels too so you don’t have to carry it around your home. It should be easy to assemble and disassemble if necessary. No one really has the time to spend an hour putting together a simple hair steamer every week. These are the basic things to look out for in a good standalone professional hair steamer. Follow the directions of the manufacturer. Start with clean hair so the steaming process is more effective. Use distilled water or bottled water. It facilitates better flow of steam. Make sure you get all of your hair under the steamer so the heats get into all your strands. 30 – 45 mins/session is fine. Any more is slight overkill. If you have trouble sitting still that long, read a book or watch something on your iPad. Once you come out from under the hair steamer, wait a few minutes before rinsing out the product. There’s some debate on whether one should use a shower cap/cling film or not but personally, I preferred without the cap. I felt my strands were softer afterward. Steam at least once a week to get the full range of benefits especially if you have super dry hair. Any more could lead to over-moisturized hair which is just as bad. 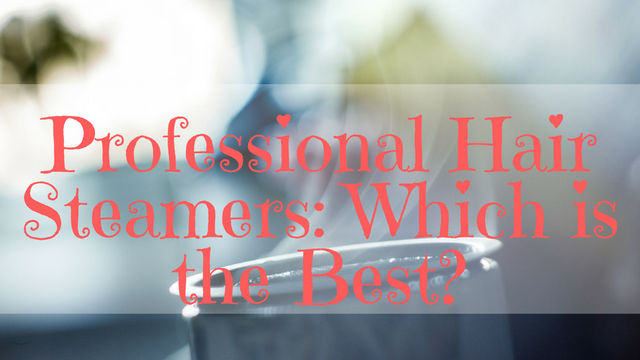 Which Professional Hair Steamer is the Best? If you’re having a budget crunch and want cheaper options, the next post will cover portable hair steamers.